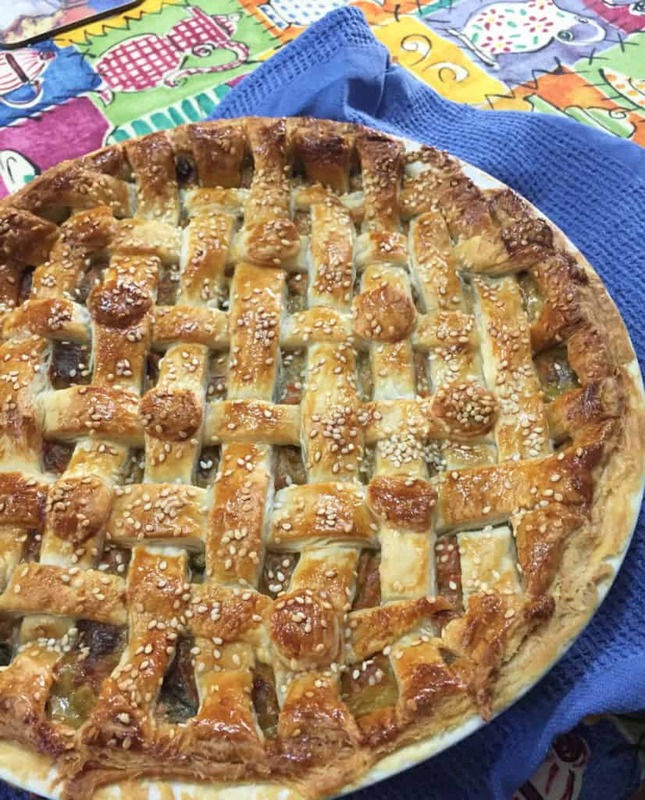 When I posted a picture of this Easy Cheesy Vegetable Lattice Pie on Instagram it got such a positive reaction that I agreed to write up the recipe. The Easy Cheesy Vegetable Lattice Pie is impressive enough for Sunday lunch and simple enough for a weeknight supper. 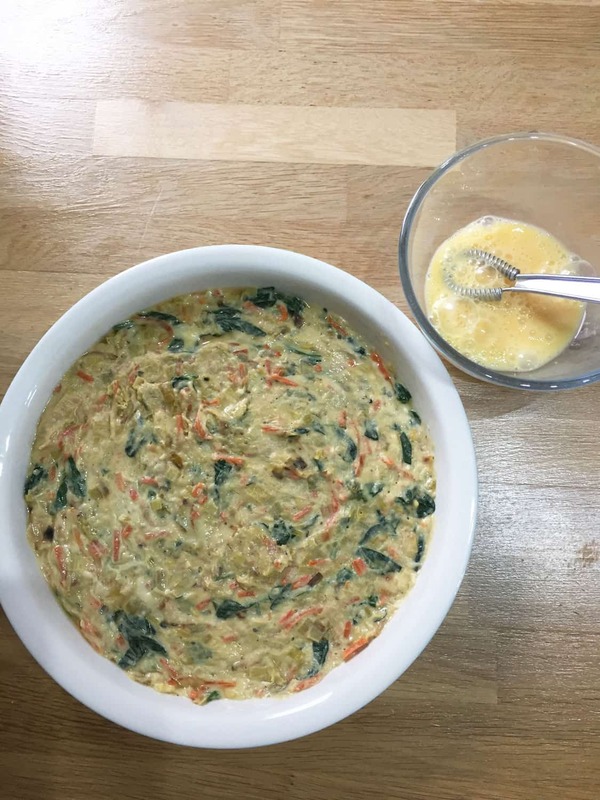 The sauce for the Easy Cheesy Vegetable Lattice Pie, is a simple cheese and leek sauce as its base, with added carrots and spinach it boosts the vegetable count, always a bonus when you are aiming for 5-a-day or 10-a-day. A creamy, cheesy vegetable filling with a crisp puff pastry lattice topping, Easy to make and impressive to serve. Heat the butter and oil in a large pan, add the leek and carrot and cook on a low heat for about 8 minutes with the lid on, stir occasionally. You want the leek and carrots to soften but not colour. Turn the heat up to medium and add the flour, cook the flour for about five minutes,stirring. 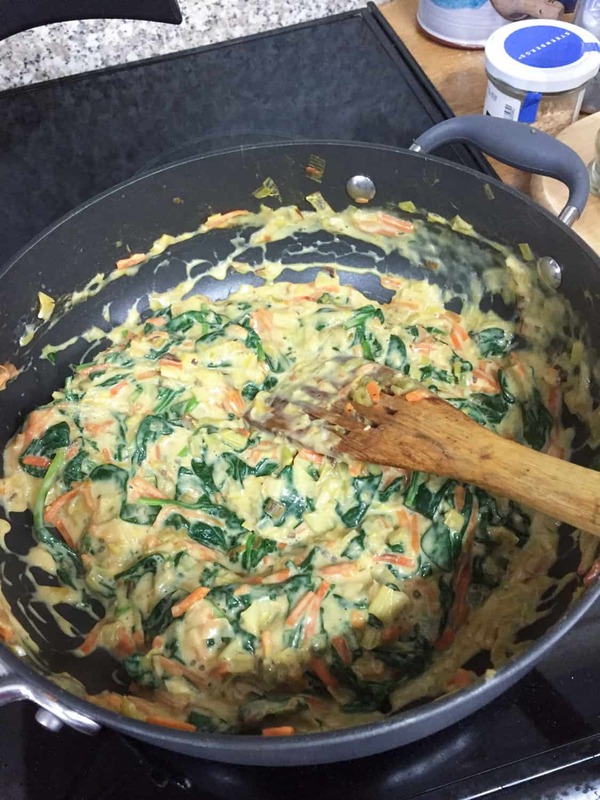 Slowly add the milk or stock, stirring all the time, to make a thick sauce, bring to a bubbling simmer and cook for about 3-4 minutes..
Add the cream cheese, spinach, garlic granules and the spinach, replace the lid and let the spinach steam, once it has reduced stir it into the sauce. The moisture from the spinach will help to make the sauce slightly thinner. Take off the heat and add the grated cheese, stir through the sauce and set aside to cool. Butter your pie dish (mine is 27 cm) and fill evenly with the sauce. Cut the pastry sheet into 1.5 cm strips across the short edge. Brush the edge of the pie dish with beaten egg and stretch two strips to fit round the edge of the pie dish, then brush the top of the pastry strip with beaten egg. 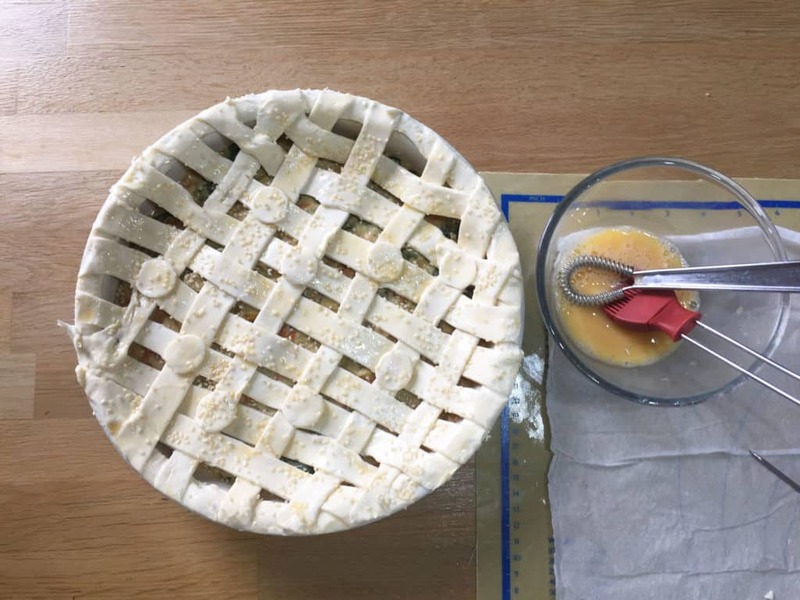 Attach the pastry strips to one edge of the pie, then add more strips at a 90 degree angle, then cross them over and under each other to make the lattice. If the pastry breaks or you have to join two pieces together you can cover the joins with circles of pastry cut with the end of an icing (frosting) nozzle or other small cutter. Brush the lattice with beaten egg and sprinkle with sesame seeds. erve with potatoes and a green vegetable or with a side salad. It’s important to let the pie filling cool before adding the pastry or it will sag with the heat. Using a wide pie plate means that the filling heats up quickly again and provides the opportunity for lots of crisp pastry, which is what pie is all about. Don’t be put off making the lattice topping, it’s really not difficult to do and you can mend any breaks by pressing the pastry strips together and covering with a little disc of pastry, I cut these with the end of an icing/frosting nozzle. But if you have other small pastry cutters you could use those. The sesame seeds also help to make it look a little special, but if you don’t have any don’t worry, it will still taste as good. Really like the sound of this Janice, perfect for using up some veggies at the end of the week. Yes, definitely that kind of recipe. Easy to add different veg to the sauce too. Oh, this looks so good! I’ve been craving pie for ages but still haven’t got around to it because I don’t have a clue where to start because I’m not much of a baker. I’ll just have to take the plunge. Not much baking to do with this pie, so I’m sure you will manage. No need for veggies to miss out on pie! 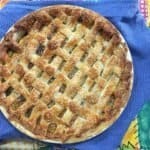 The latticing on this pie is fantastic. I’m hopeless at doing anything fiddly like this. It sounds scrumptious too. Thank you, it really isn’t that difficult and was very much a last minute thing with much patching! How much flour do you use, it isn’t in the ingredients ? Oops, thanks for letting me know, I use 1 tbsp plain flour and haves now added that to the ingredients. I hope you enjoy the pie! can I make this in advance and freeze before baking or after baking? Hi Nimi, I haven’t tried freezing it, but it should work okay if you freeze it before baking.